In order to enhance the completeness and accuracy of prediction, three computer programs, tRNAscan-SE, ARAGORN and tRNAfinder, were used in combination since their algorithms are partially different and render somewhat different results. First, we checked to what degree the predicted regions and the anticodons of individual tRNA genes were consistent with each other. 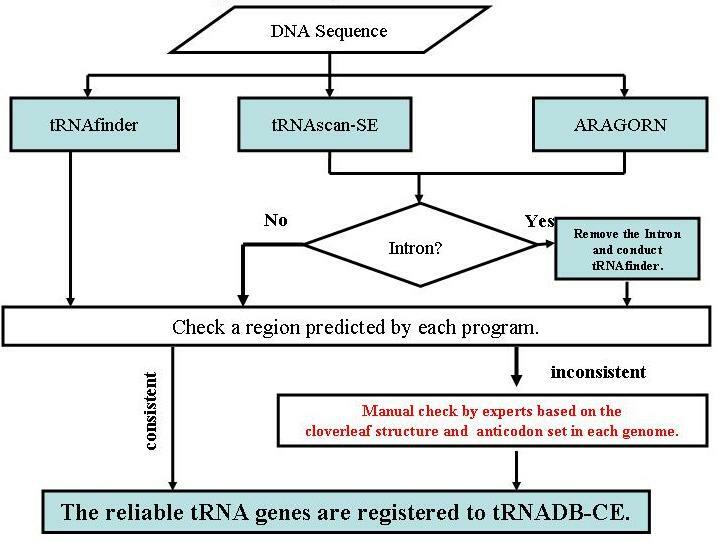 Second, the discordant cases (approximately 3 % of the total of bacterial gene candidates) were checked manually by three experts in the tRNA experimental field independently and were classified into three categories after their discussion: A) reliable tRNA gene (�Z), B) not tRNA gene (�~), and C) ambiguous case (��). This manual check was conducted with reference to the consensus sequences of various cloverleaf structures and the various chractersitics of functional tRNAs, such as chractersitics specific to individual amino acid groups, which are difficult to include in computer algorisms. Finally, by investigating the minimum anticodon set most likely essential for translation system of each complete genome, the candidate genes for the lacking anticodons were searched. In addiotn, by performing TFAM program (an automated statistical classifier of tRNA function), three different characteristics of tRNA-Met [initiator tRNA-Met, elongator tRNA-Met and tRNA-Ile whose CAU anticodon is enzymatically converted to read AUA codons] were assigned and noted in �gcomments�h part in �gThe detailed information of tRNA gene sequence�h page. Based on the knowledge of experts obtained from literatures, the splitted-tRNAs (His, Glu(CTC), Glu(TTC), iMet and Trp) in Nanoarchaeum equitans reported by Randeau et al. (Nature, 2005) are also noted.